Our clients can list their property for sale and advertise their property for rent at the same time in the MLS. We offer Tenant Procurement for a flat fee. We show your home for lease. We have the renters fill out a rental application. We prepare and execute a limited property management agreement. We screen for a qualified tenant by a credit and background check. We prepare and execute the residential rental agreement. We collect the first month’s rent and security deposit. We disburse the tenant's security deposit to the owner to hold for the lease term. We charge no monthly fee. $150 upfront and 75% of one month’s rent at lease signing with $200 minimum finders fee. 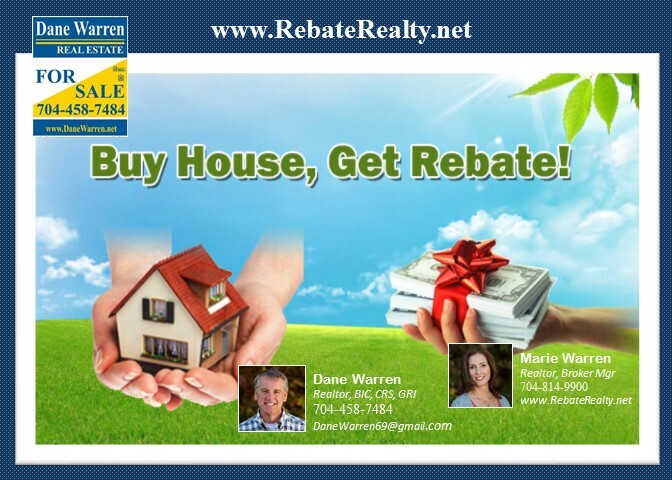 Dane Warren Real Estate Sales Consultant can meet with you to discuss the best options to tackle current market conditions. You can list your home for sale and advertise your home for rent at the same time. You will save yourself time and money by offering both options. If you decide to try and lease and sell at the same time with us, we drop our upfront rental advertising fee from $150 to $125. Do you have your home listed with another real estate firm? We are happy to work with your Realtor. If we find a Tenant before you find a Buyer then you simply remove your property from the sales market. A $150 rental marketing fee will be collected upfront in this case since your home is not listed with Dane Warren Real Estate. If your Realtor finds a Buyer before our firm finds a Tenant then you send us a copy of your contract and you can terminate your leasing contract with us. § Charlotte Metro MLS System Rental Section. Over 8,000 Realtors access this data base. § Our MLS/Internet Data Exchange allows 1,000 plus web sites to advertise your property for rent. § Purchased Google ‘key’ words to optimize our firm’s Web Site to Buyers/Renters.